If you like these kind of stories, check out David Greenberger's audio and comic book series: The Duplex Planet !! Hardy Fox. No alias. Just Hardy Fox. This is Hardy Fox unlike you've ever heard him (or Charles Bobuck) before. It still sounds a lot like The Residents. And maybe also a bit like Laurie Anderson. 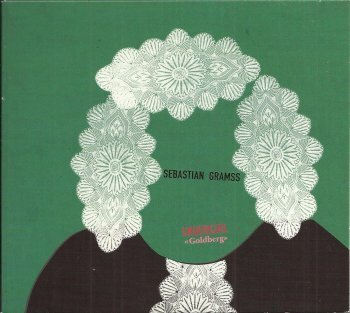 Adding data to the Underkarl discography, here's "Goldberg", Sebastian Gramss' tribute to the music of Johann Sebastian Bach. The album presents16 compositions that were inspired by J.S.Bach. Two short movies, one trio (Too Noisy Fish = Peter Vandenberghe, Kristof Roseeuw and Teun Verbruggen) and one writer (Dimitri Verhulst). Paul White, also known as He Who Samples Some Zappa From Time To Time, has a new album out. 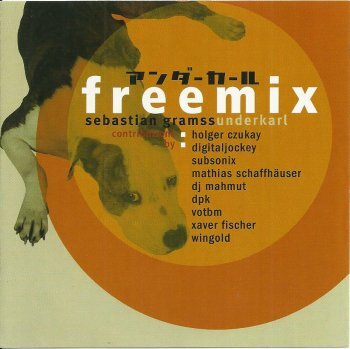 One year after Underkarl's "Second Brain" album, the Enja records label released "Freemix", subtitled "Second Brain Revisited". Obviously, the album presents reworked versions of most the compositions that could be found on "Second Brain". The result is quite impressive and has added a contemporary funky flavour to the original jazz tracks. Except for Holger Czukay, I was not really familiar with various collaborators but that only added to the surprise. 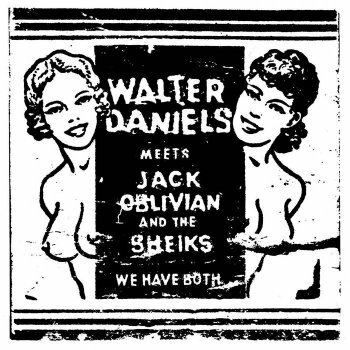 Los Angeles, CA - One of the few remaining truly independent, privately owned record labels in existence today, L.A.-based Cleopatra Records has been championing underground music and outsider artists since its inception in 1992. Now, the label has teamed up with the biggest music festival dedicated to discovering and promoting new talent, SXSW, to announce the first ever official Cleopatra Records showcase. Headlining this special event is legendary songwriter/producer/guitarist, Todd Rundgren, an artist well known for pushing the boundaries of rock and pop with his distinctive flair for the eccentric and unusual. Todd’s newest album, White Knight, was released by Cleopatra Records in May of last year and features guest performances by Trent Reznor, Robyn, Joe Satriani and more. Featuring the voice and guitar of Robert Fripp, low frequency groove reinforcements of Tony Levin and his espresso machine, virtuoso Warr guitar musicality by Trey Gunn, Turkish synthesizer mastery from Cenk Eroglu, cuttings and snippets of vocals from Adrian Belew and David Byrne, Soothing Tabla acupuncture lesson from Aloke Dutta, Artwork and cartoons by Denis Rodier, And more, including you, the listener, and your ability to perceive things within this platter that may or may not exist in the first place. 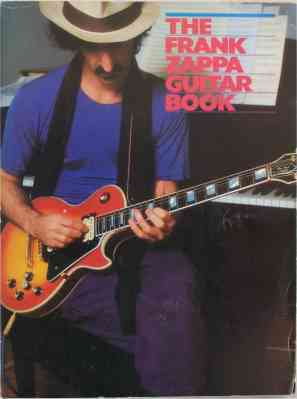 I think it was earlier last year that "The Frank Zappa Songbook Vol.1" got a re-issue. 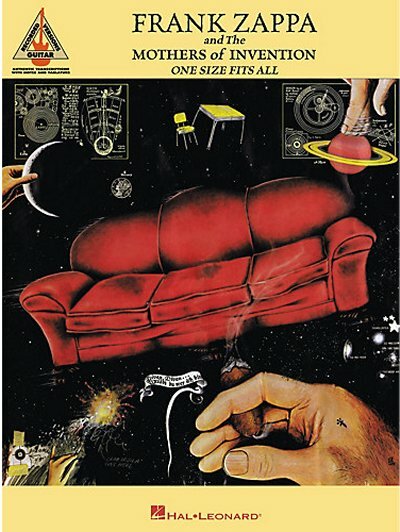 You might know the Filthy Habits Ensemble from their all-Zappa-compositions "King Kong" album as part of the Unmatched series on the Hall Of Fame label. Or maybe from their appearance at the Zappanale festival in 2010. The band released their "Filthy Habits Ensemble Plays Stravinsky" album in 2013 !! Exciting news!!!!!!!!!!!!!! The BRAND NEW and third Condor Gruppe album 'Interplanetary Travels' is released on 16th March and available to pre order. Condor Gruppee is back with a new record, Interplanetary Travels. The title hinting at Sun Ra is no coincidence. Pushing their musical boundaries even further, Condor Gruppe recorded 8 new songs that give you the creepy feel of a horror scene, the heroism of the best film scores and the hypnotizing grooves of jungle tribes. 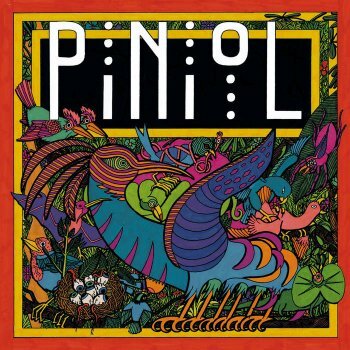 Diverse, yet exciting and challenging enough to give you a mesmerizing trip through the band’s own dusty record shelves. WIBG, formerly known as Wooden Indian Burial Ground, is touring Europe in March and early April. The band will be promoting their new release "Winnie & The Nihilist". 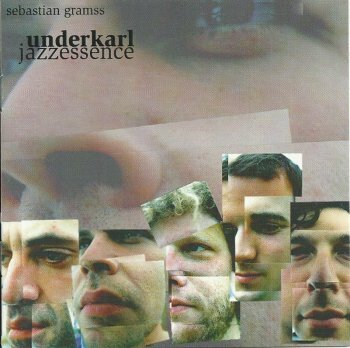 German ensemble Underkarl was founded in 1993 by Sebastian Gramss. The band recently released their 8th album and they're worth your attention. "Jazzessence" was the band's second album. Released in 1999. You get 74 minutes and 30 tracks of Brecker Brothers, Ellington, Hendrix, Gil Evans, Charles Mingus, and more. All reworked (and reassambled / recreated) by Underkarl. MoonJune Records has just released an album by Beppe Crovella on which he plays the music of Soft Machine keyboard player and composer Mike Ratledge : "What's Rattlin' On The Moon?". 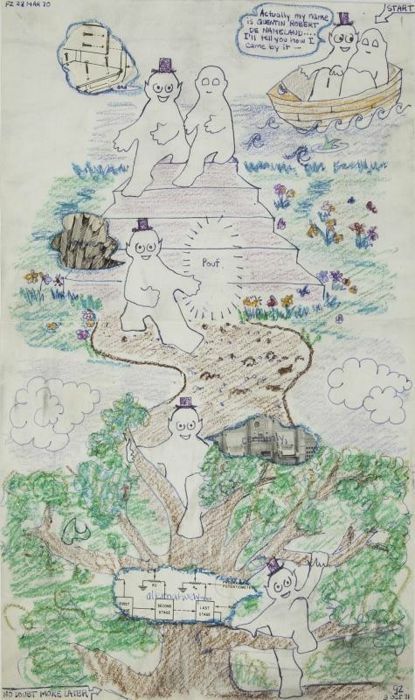 Original Art piece by Frank Zappa and Gail Zappa. 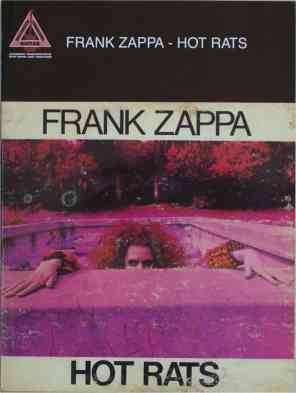 Purchased at the Zappa estate auction at Julien's Auctions in Los Angeles. 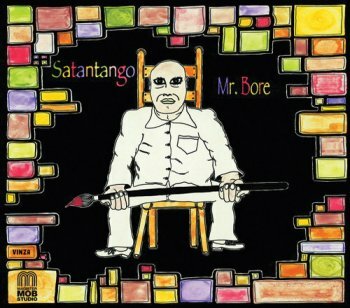 Satantango's first album (released on the Italian Wallace Records label) includes 10 tracks (1 to 10), but the album also lists a track 0 (zero). And it's this hidden track that caught my interest as it's Satantango performing Don Van Vliet's 'Clear Spot'. 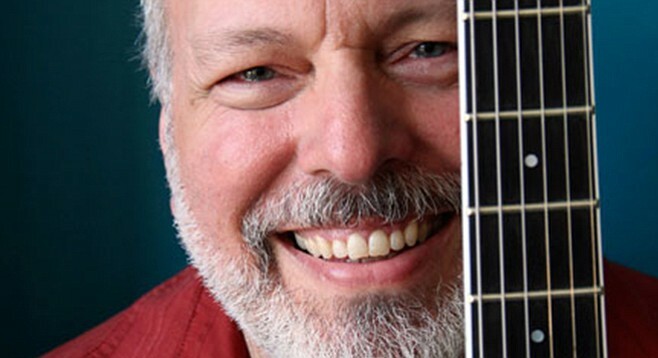 Mike Keneally: “It’s definitely not for me to imagine how he might have used the technology." 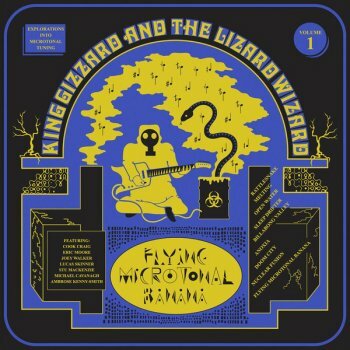 I don't know much about the dozen other albums by King Gizzard And The Lizard Wizard as I keep on playing "Flying Microtonal Banana". Psychedelic microtonal music. At least, on this album. And I did add their discography to the United Mutation Archives. LES GEORGES LENINGRAD - DEUX HOT DOGS MOUTARDE CHOU. 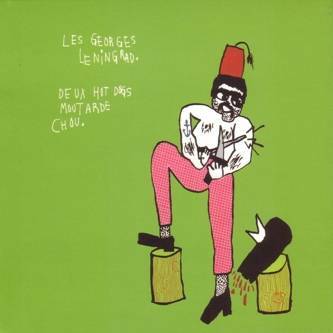 Garage rock / experimental rock band Les Georges Leningrad are from Montreal, Quebec. They covered The Residents' 'Constantinople' on their "Deux Hot Dogs Moutarde Chou" album from 2002. Excellent version !! The album has been re-released at least once (my copy is from 2004 and is on the Alien8 label) with one different track.. 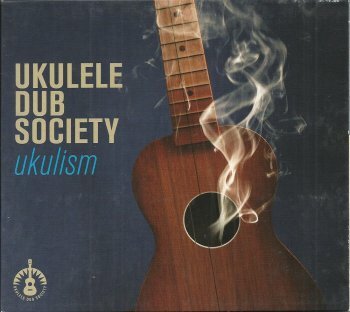 The Ukulele Dub Society is a project by Pit Baumgartner. On "Ukulism", Pit & friends display some fine playing. A couple of original tunes, mixed with some classics, show the added value of a ukulele. 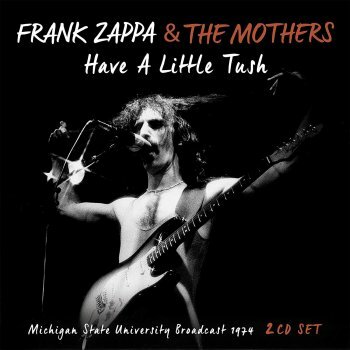 Includes Johnny Guitar Watson's 'Real Mother For Ya' and Frank Zappa's 'Inca Roads'. According to Discogs, Jim Gibson started the Noiseville record label in 1998 to release music for his band Unholy Swill. After two albums and a bunch of singles, the punk rock band (or should I say drunk rock band?) did a final concert at Rockin Rex in Yonkers, NY. Must have been around 1993. 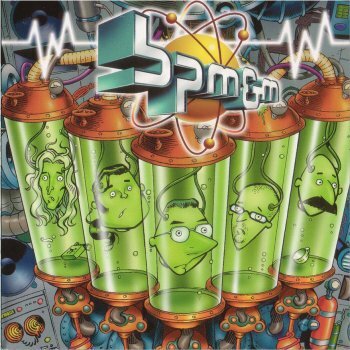 Next to the band's early singles and some other rare stuff, this "Legacy Of Stupidity" album includes a couple of songs from their final concert. 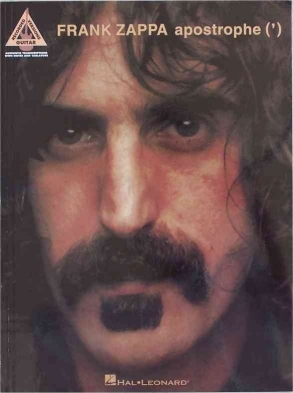 One of these songs is Frank Zappa's 'Willie The Pimp'. They will be releasing an album later this year. 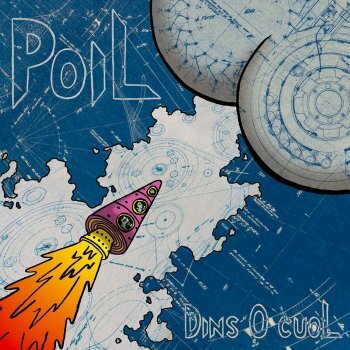 Data has been added to the Poil entry over at the United Mutations Archives, together with some earlier Poil releases. I recently received my copy of this excellent re-release. As far as I know, "L'ire Des Papes" had only been made available as a download and "Dins O Cuol" had been released on LP and on CD (next to the download) but had been unavailable on a physical format for quite a while. Enter lifesaver Charly and his FreakShow Records label who put both of the albums together in a 2CD-set. Limited release of 100 copies. Washington DC-based alternative country band Shortstack tackles 5 songs on their 2008 "Covers EP". It includes compositions by Ray Davies, John Fogerty,... and Don Van Vliet. 'Her Eyes Are A Blue Million Miles'. The documentary is up and running! News just posted here about our partnership with the awesome folks at Great Point Media. GPM are independent financiers which gives us maximum creative freedom to make the movie we all want. I couldn't be more excited to be working with them and making the movie in this manner. Fully independent, the FZ way! We have an enormous amount of archival footage (like you don't know that already) and will spend the better part of the next several months going through the material and getting it to a place where we can work with it in editorial. French duo / trio Jean Jean released their first EP in 2010. Their first full-length album, "Symmetry" saw the light of day in 2013. Their mix of complex, instrumenteal math rock with dance floor beats got them concerts in Europe, the U.S., and even Japan. Their brand-new album, "Froidepierre, is named after the mountain cabin where the new tracks got recorded. It's a fine collection of energetic songs that focusses more on the beats than on the math rock-aspect. Out on Head Records, available from Mandaï. C74 is Brussels-based project by graphic artist, photographer and musician Fabrice Toussaint. C74 explores tribal sounds and dissonnance like first albums of early eighties N.Y. bands. Clarinet player Alessandro Carbonare teamed up with the Tetraktis Percussioni ensemble to perform pieces by and tributes to, among others, Béla Bartok, Thelonious Monk, Steve Reich, Igor Stravinsky and Frank Zappa. 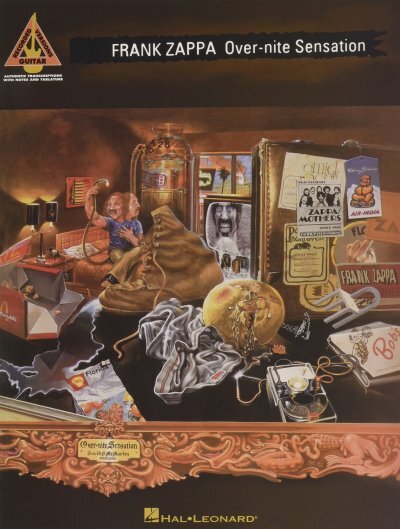 The Zappa tribute is entitled "FZ For Alex" and is, in fact, a re-arrangement of Frank Zappa's 'Inca Roads'. 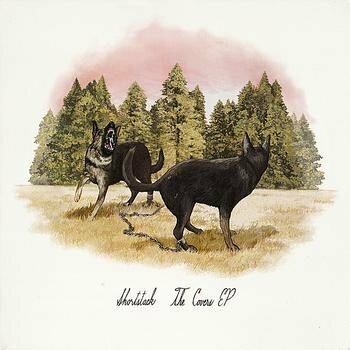 This album got released in 2013 on the Italian devision of the Universal label. A couple of recent Charles Bobuck releases (on CD by Klanggalerie) have been made available on Bandcamp. To make things more confusing (or artistic, as some might say), these re-releases carry a different album cover. 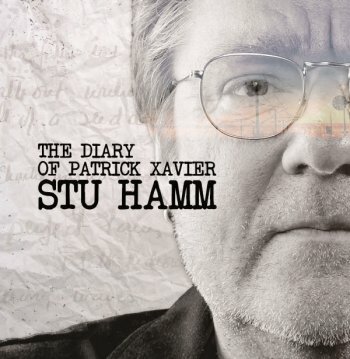 Legendary bassist Stu Hamm will be touring the US end of February in support of his highly anticipated new concept album “The Diary of Patrick Xavier”! Stu Hamm has been the go-to bass player for the world's great musicians. Time spent playing with Steve Vai and Joe Satriani has cemented his place among the greats and gave him the platform to display his pioneering bass techniques to adoring crowds worldwide. 2015 started out with a bang. My life was tossed in a blender, and I decided to go on a walkabout to sort things out. I booked as many gigs as possible and became the Flying Dutchman of bass players. Those of you who actually know me, know that I am always reading something. And, as much as I love the convenience of my Kindle, and reading comics on my iPad, nothing beats the feel and smell of actually holding a book in your hands. When I finish a book, I leave it in the seat pocket in front of me (if I'm in a plane), or hide it somewhere in the hotel room, where I hope that housekeeping won’t find it, but a bored, lonely fellow traveler might…pay it forward y'all!! And so…I finished reading “The Shadow-Line” by Joseph Conrad on the beach in Pescara, and pedaled it back with me at the end of the day to Citta'Bianca Hotel and placed it on the bookshelf in the lobby…Then, something caught my eye…It stood out because what was written on the spine was in English. “The Diary of Patrick Xavier”. What I held in my hands was a diary of an American named Patrick Xavier who, after life changing events, had decided to travel for 18 months to find…?? ?...and to keep a journal of his physical, emotional and spiritual journey. And now it gets weird. Although the Agent of Change that happened to Patrick was quite different from what happened to me, the experiences he was going through were just too close to my own to be ignored. We were searching for the same answers to the same questions. Stu Hamm has traveled the world from Boston to Belfast to Budapest, Bali and Berlin. He's performed in a 19th century circus tent with Joan Baez, and recorded a duet of “Do Right Woman” with her. HAMM has performed with Mick Jagger, played sold out shows at Royal Albert Hall and in front of 120,000 people in Mexico City with a Mexican Rock Band. Hamm graduated from the Berklee College of Music in Boston, where he met guitarist Steve Vai and, through him, met Joe Satriani. He played bass on Vai's 1984 debut solo album, “Flex-Able” and in 1990 Hamm was awarded the Distinguished Alumni Degree from his Alma Mater. He has performed and recorded with Steve Vai, Joe Satriani, Eric Johnson, Michael Shenker, Frank Gambale, and many other well-respected guitarists, however, it was playing live on tour with Satriani that brought Hamm's skills to national attention. Subsequent recordings with Satriani and other rock/fusion artists along with the release of his own solo recordings (featuring keyboard player Tommy Mars, guitarists Alan Holdsworth and Robert Fripp, drummers Steve Smith and Tommy Lee), solidified his reputation as a bassist and performer. 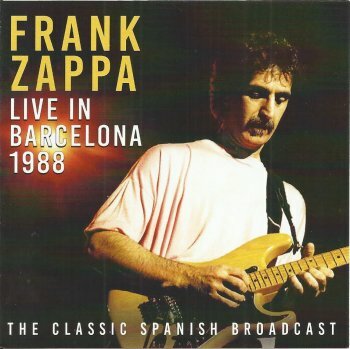 The Sonic Boom record label recently released this 2CD set with Zappa's 1988 Barcelona concert. Another so-called 'radio show album'. A lousy job. Indeed, as the recording has way too many annoying drop outs. Don't buy this. It's rubbish. For the best available version of this recording, visit Zappateers. July 22, 2016 at the Saint Emilion Jazz Festival. Tom Ibarra on the guitar !! 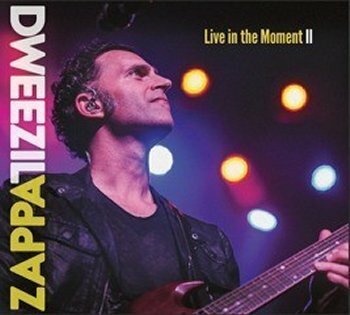 I've been giving Dweezil Zappa's "Live In The Moment II" some extra spins the last couple of day. 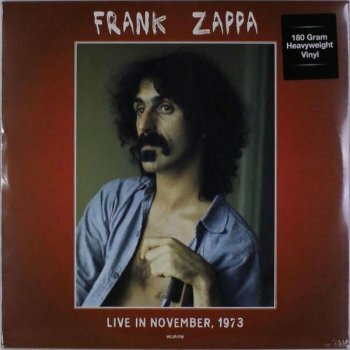 I like the mix between the Frank tunes and his own improvisations (of which some have a familiar sounding backing...). R.Stevie Moore and Alan Jenkins recorded an album together : "The Embodiment of Progressive Ideals". 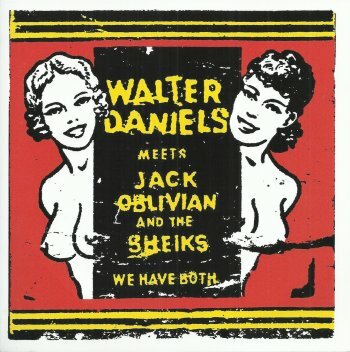 It's out on CD on Cordelia Records. 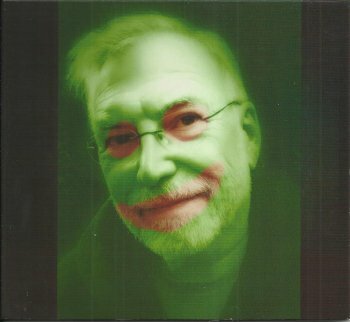 Barry Hansen (aka Dr. Demento) will turn 77 in a couple months. 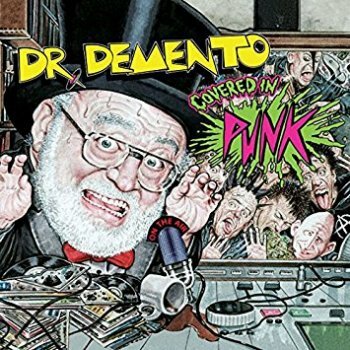 The Demented Punk Records Records label recently put out a 2 CD set entitled "Dr Demento Covered In Punk". The album has Barry presenting punk version of tunes by artists that are forever linked to Dr. Demento's radio show like Barnes & Barnes (Fish Heads !! ), Weird Al Yankowic or Frank Zappa. Disc two includes Dr. Demento and Moon Zappa introducing Dale Bozzio doing 'Disco Boy', but there's also a great version of 'My Guitar' by the Meatmen. 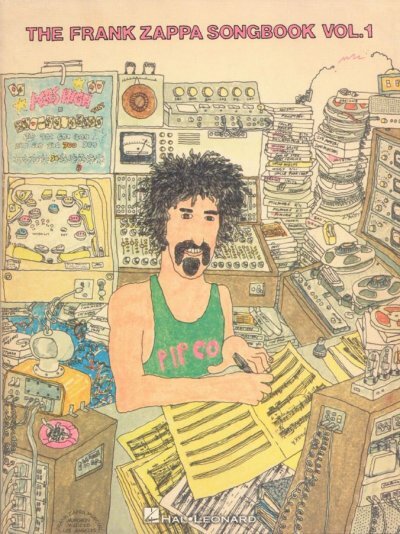 Or as Barry says : "Every Dr. Demento Tribute Compilation needs a Frank Zappa song or two". Also out as a 3 LP set in two different editions (colored vinyl and multi-colored something). 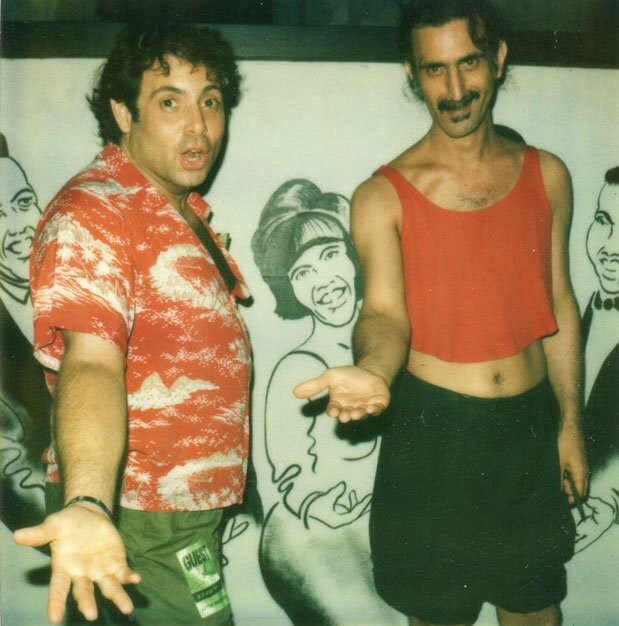 Here's a picture of Bleecker Bob (of the famous NYC record store) & FZ. Tom Trapp (who arranged pieces by Frank Zappa and by (and for) Steve Vai, to name just two) is touring with Maxsax, a band that features Tini Thomsen (baritone sax), Nigel Hitchcock (alto sax), Mark Haanstra (bass, and Joost Kroon (drums). Multi-instrumentalist Tom will be playing the (funky) guitar. Next Saturday, in concert at the 'Paradox' jazz club in Tilburg, NL. 7 CD's in one box. With great music. In my humble opinion, some of the best music that was ever made. Period. I don't need no Halloween Zappa Mask. Or a cape. Let alone some memory stick with x concerts. Sure, I bought the Halloween Pack, but there's nothing like a perfect looking box with a fine booklet and a set of CD's. Superb !! Best release of the year. Already. 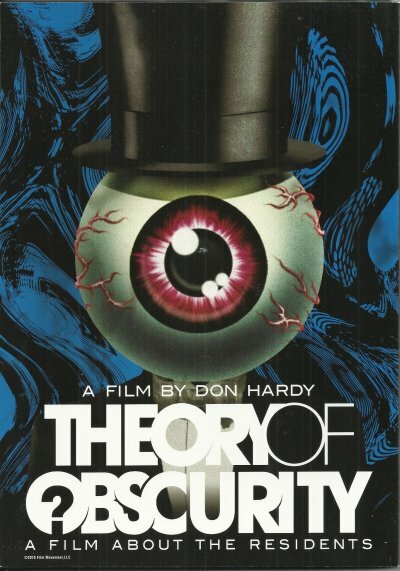 These Japanese 112-page "Theory Of Obscurity" books were sold in Japan during the screenings of the Theory Of Obscurity movie. Former Zappa drummer Vinnie Colaiuta is featured on the new Toto album : "40 Trips Around The Sun". 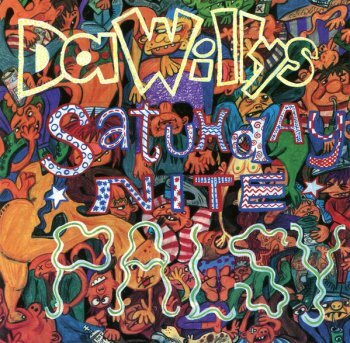 New York City based punk band Da Willys released their "Satuhday Nite Palsy" album on the German Brake Out Records label. It got released on vinyl and on CD. 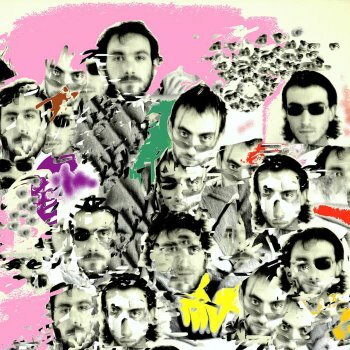 Track number 10 is an up-tempo version of Captain Beefheart's 'Fryin' Pan'. I mentioned this 7" last month as it has an excellent version of Captain Beefheart's 'I Love You, You Big Dummy' on the B-side. It has been released in three different versions: 100 copies with a black and white cover (with the 7" on black vinyl) plus 100 copies with a colour cover on yellow vinyl and 100 copies with a colour cover on red vinyl. Promoting their latest album, Spinifex played a fine concert at the 'Plusetage' in Baarle Nassau, NL, last month. "Amphibian Ardour" got recorded in Lisbon, Portugal, and one can hear that the band had a good time. I would call it adventurous. Or energetic. Or probably both. After having been the frontman for 1960s beat group The Rattles, Achim Reichel co-founded the psychedelic pop group Wonderland with Les Humphries in 1968. In 1971, Achim Reichel left the band and started his solo project A.R. & Machines. Here's 'Cosmic Vibration' from the "Die Güne Reise" (1971) album. 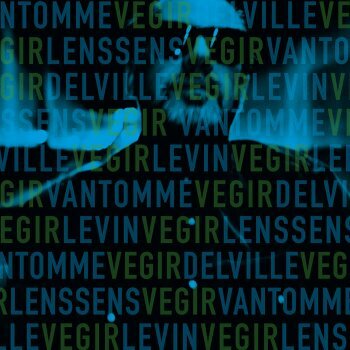 I mentioned this excellent album by Dominique Vantomme a little while ago as I had given the digital version a listen. In the meantime, I received the CD so I'm now able to give you a little update. "Vegir" is a very enjoyable album. It's the perfect soundtrack to unwind. Meandering themes hosting fine improvisations. 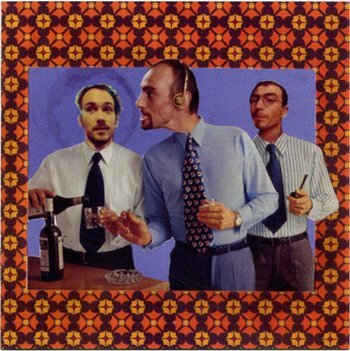 Featuring Dominique Vantomme, Michel Delville, Tony Levin and Maxime Lenssens. 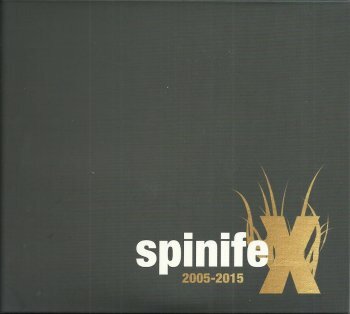 August 2015, Spinifex started a kickstarter project to release "2005-2015", a box that would include their first four albums plus one bonus disc with live material from various spinifex incarnations. Eventually, the box was made available in 2016. Next to "Trioda", "Hipsters Gone Ballistic", "Veiled" and "Maximus", the set included "Spinifex Live" as an extra. 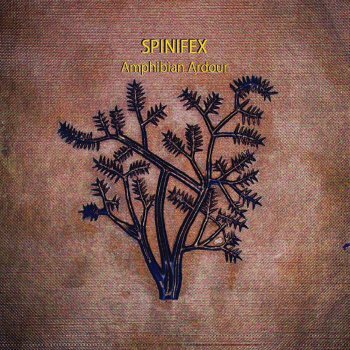 This bonus album presented material by "Spinifex Indian Spin", the "Spinifex Tuba Band" and "Spinifex Bollycore". with special guest Napoleon Murphy Brock and Denny Walley. 13 SUN - PHILADELPHIA PA - TO BE CONFIRMED/ANNOUNCED !! 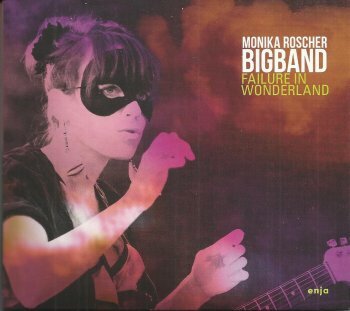 The first album by the Monika Roscher Bigband, "Failure In Wonderland", got released in 2012. It's a perfect companion for the more recently released "Of Monsters And Birds". Modern big band jazz, sometimes even with vocals. And they'll be at Zappanale !! and a 2 CD set : "Have A Little Tush"
Next month, the Cold Smoke Records label will team up with Czar Of Revelations to release "Clôture", the brand-new EP by Swiss post-rock / metal band Darius. 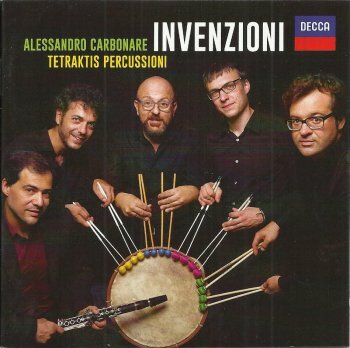 Alessandro Carbonare and the Tetraktis Percussion ensemble recorded a Frank Zappa composition (or a Frank Zappa tribute) on their Invenzioni album. 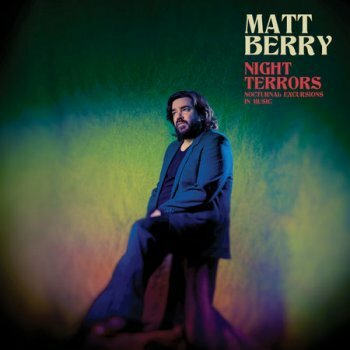 Actor ('The Mighty Boosh' sitcom) and musician Matt Berry recently released "Night Terrors". This is laid-back / jazz / lounge music. Track 6 is Matt Berry's take on Zappa's 'Mr.Green Genes'. Keep in mind that the album version does sound a lot better, but you'll get an idea of the arrangement. It does not happen that often, but every once in a while I discover an album that makes my jaw drop. "Of Monsters And Birds" is such an album. 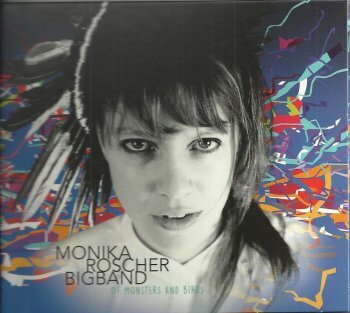 I recently caught a bit of music by the Monika Roscher Bigband on YouTube and that sounded quite interesting. It made me check out "Of Monsters And Birds", her latest album, and I got blown away by it. Bert Dockx' Flying Horseman project has recently released its fifth album. Inspired by 1970's psychedelic rock, yet with a very recognizable sound. 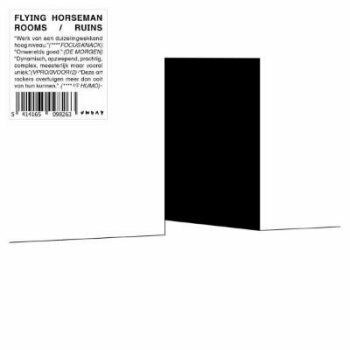 At times, "Rooms / Ruins" sounds fragile but there's always this underlying tension and energy. First solo album by former Residents composer Hardy Fox after the Charles Bobuck era. An album full of minimal love songs, a portrait of the young Hardy Fox. Today we’re anouncing the name of our new guitar player. As of now, Bruno De Groote will join us in the writing of new material, the recording of a new album later this year, and on stage, wherever dEUS is setting sail to. Trust us: He is flamboyant, well dressed, and he can swim! More importantly, he’s a great guy, a soulful singer and a hell of a guitarplayer. We welcome him in the dEUS family, and are excited about him following in the footsteps of a great cast of guitarists over the past 25 years. So hear, hear.....Bruno The Great is among us! Spread the word loudly or whisper his name in awe. Italy - Armonite, the instrumental rock collective led by composer Paolo Fosso and violinist Jacopo Bigi, signed with LA-based indie label Cleopatra Records for the release of their new album, "And the Stars Above". Beat Love Oracle is a spin-off of Frank Nuyts' Hardscore ensemble. The quartet has already done some try-outs and is aiming at some concerts at the Gentse Feesten festival, next July. Ballet Mécanique (1923–24) is a Dadaist post-Cubist art film conceived, written, and co-directed by the artist Fernand Léger in collaboration with the filmmaker Dudley Murphy (with cinematographic input from Man Ray). It has a musical score by the American composer George Antheil. Gov't Mule has officially announced their 2018 Spring Tour kicking off April 18 in Bethlehem, PA and making stops in Baltimore, Syracuse, Port Chester, Asbury Park, Mobile and more on the way to their annual show during Jazz Fest at the Saenger Theatre in New Orleans. Joining The Mule will be Kentucky rockers Black Stone Cherry, The Marcus King Band (in New Orleans) and The Tangiers Blues Band (in Asbury Park). 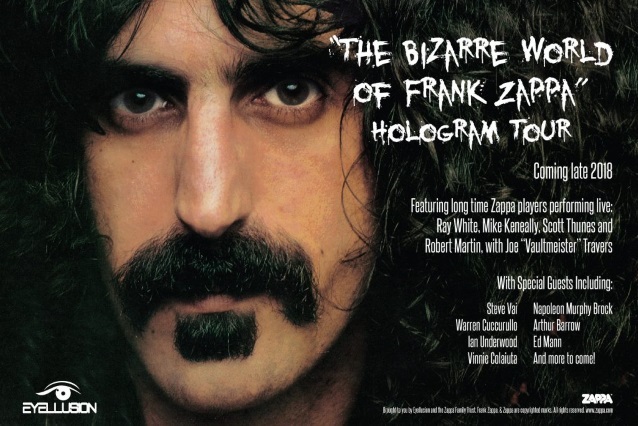 Live music hologram production company Eyellusion and the Zappa Family Trust have revealed the core lineup and guests for an upcoming Frank Zappa hologram tour. The tour will be dubbed “The Bizarre World Of Frank Zappa” and will take place late in 2018. 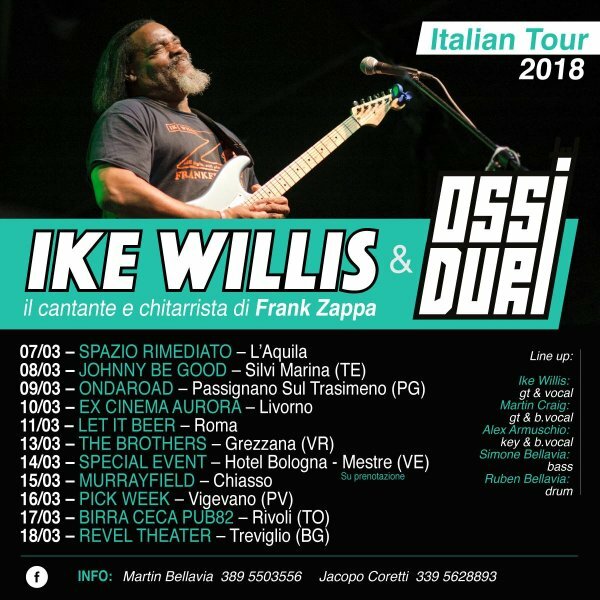 Longtime and legendary Zappa players Ray White, Mike Keneally, Scott Thunes, Robert Martin and Joe “Vaultmeister” Travers will make up the core lineup for the tour. They will be joined along the way for select shows by a bevy of special guests that have performed with FZ in the past: Steve Vai, Warren Cuccurullo, Ian Underwood, Vinnie Colaiuta, Napoleon Murphy Brock, Arthur Barrow, Ed Mann and more. 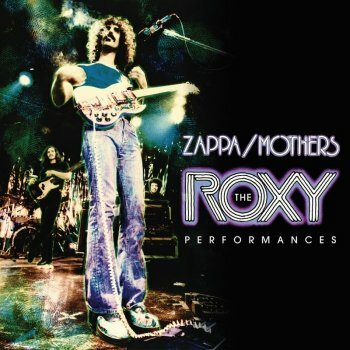 Look for the tour to feature hours of never-before-seen Zappa performance footage from the early ’70s. The dates and additional guests will be confirmed soon. THE FALL - REFORMATION POST T.L.C. 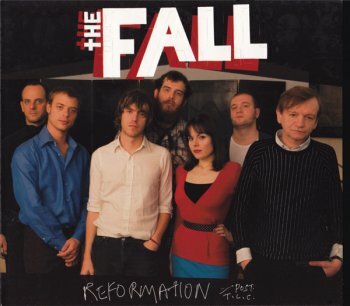 The 'enhanced CD'-version (= the U.S.-release) of The Fall's "Reformation" includes a video of the band performing 'Hungry Freaks Daddy", as recorded during their 2006 North America tour. Remember Riccardo Fassi's 1995 album? Riccardo Fassi Tankio Band Plays The Music Of Frank Zappa" ? Well, he's back with another (superb) tribute album. 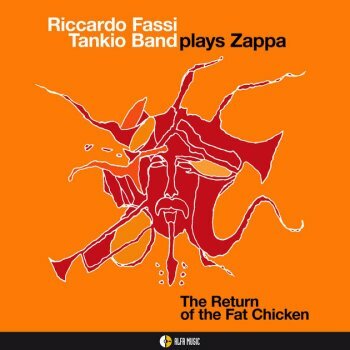 Subtitled "The Return Of The Fat Chicken", the tracklist counts ten Zappa compositions, the George Duke classic 'Uncle Remus' and a couple of intros and outros composed by Riccorado Fassi and Antonello Salis. And also featuring the fabulous Napoleon Murphy Brock on vocals on a couple of tracks. An essential album for the Zappa freak.